"Robert is a fund of knowledge and experience." "A first choice for the more difficult cases, he brings a wealth of experience and is prepared to fight." 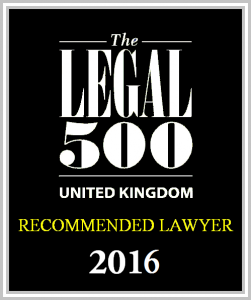 Robert Glancy QC focuses exclusively on Personal Injury; Clinical Negligence and Professional Negligence. He has been in practice for over 40 years and has been a Silk for 15 of these. Throughout his career, Robert has gained extensive experience in acting mainly for claimants who have suffered catastrophic brain and spinal injury. He has particular expertise in acting for cerebral palsied children. Robert regularly successfully settles claims winning millions of pounds of compensation for injured people and their families. Recognised in the legal directories for his formidable skills as an advocate, Robert is also a CEDR accredited mediator and has considerable experience of mediation and ADR in substantial personal injury cases. Robert specialises in all aspects of Personal Injury. He is involved in numerous personal injury cases for brain damaged and paralysed Claimants. These include a claim for a male tetraplegic in his 30s which settled for over £7m. At the time, this was the largest personal injury claim against the Government ever. He settled a claim for over £5m for an infant tetraplegic. Robert fought a long trial for a Claimant in a fatal accident matter involving safety on a motor racing circuit. He has been involved in a trial which established important principles for the assessment of damages in the case of Tunnel Miners. He acted for a 17 year old tetraplegic which settled for several £million. Robert is well regarded for his work across a broad range of cases involving Employer Liability. This includes cases involving factories, schools, offices and tunnel miners. 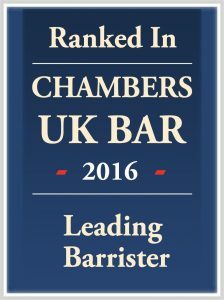 – Perzow v Bourne Leisure Ltd –  EWHC 1801 – Accidents; Defective premises; Liabilities; Public safety. Robert is a highly experienced Silk who specialises in all aspects of Clinical Negligence and Professional Negligence. Most of Robert’s cases have been for Claimants and they generally involve cerebral palsied children or catastrophic injuries.